Kygare - Lowmansville,Ky. 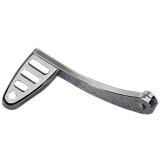 Just Recently ordered "Just bought a Billet shifter,for my Yamaha Stratoliner. The Motorsport was VERY helpful,and Most of all,saved me $$$"